On the edge of Butchertown, East Main Street bends to become Story Avenue. 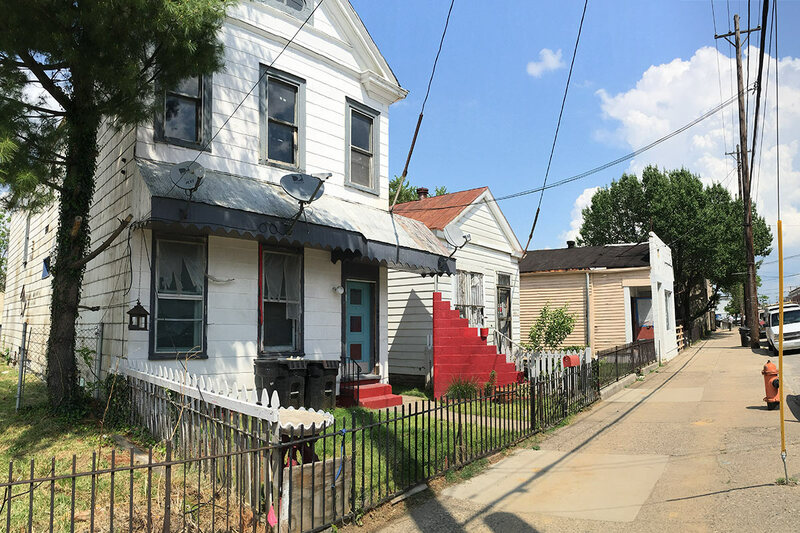 On this block, a row of sorry looking shotgun houses and boarded up buildings belie the rejuvenation that has been going on in the neighborhood for years. 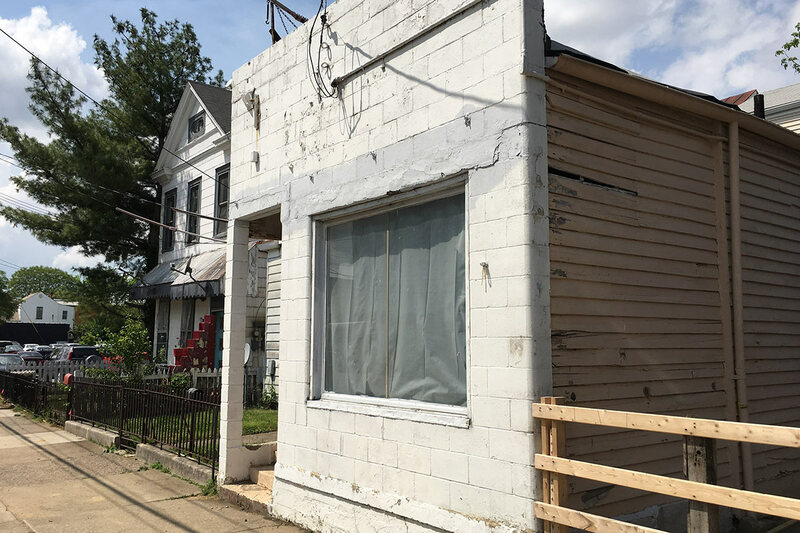 While someone speeding through might think no more of this block than as an eyesore awaiting its date with the wrecking ball, Andy Blieden saw differently. 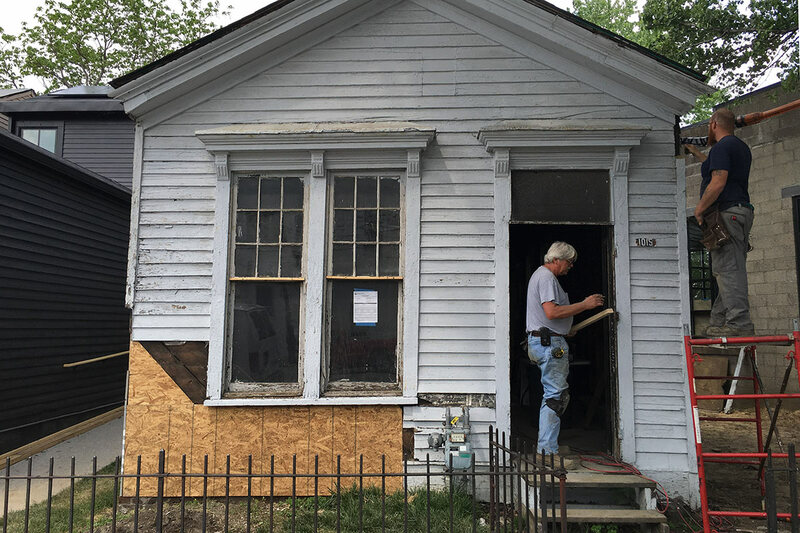 Blieden is in the middle of a major renovation campaign to save six of those structures along East Main Street and three more on the other side of the block on Wenzel and Washington streets. 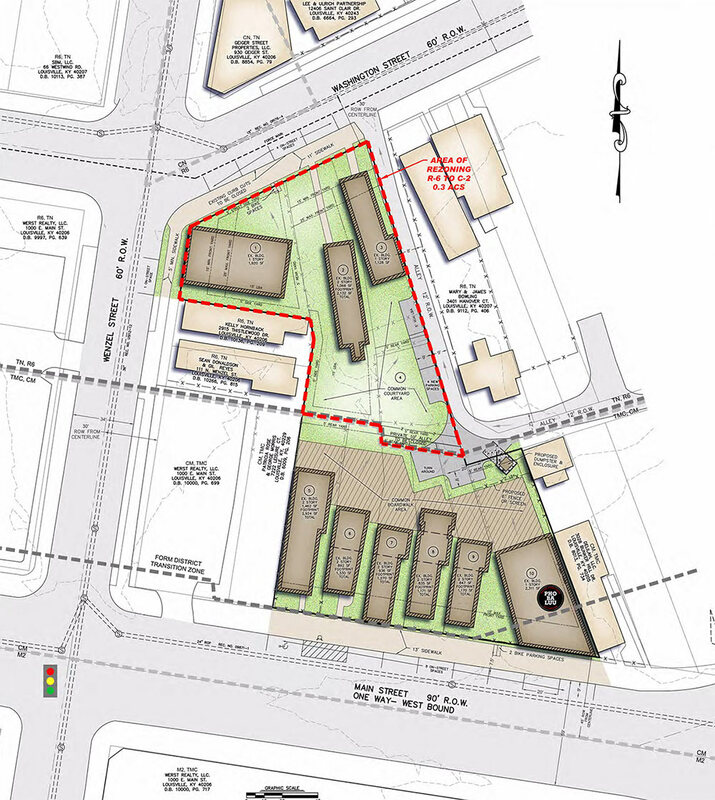 Site plan for the Butcher Block development. While visibly excited about the project—called the Butcher Block—Blieden is quick to point out that the concept was not his idea. But it’s one he believes in. 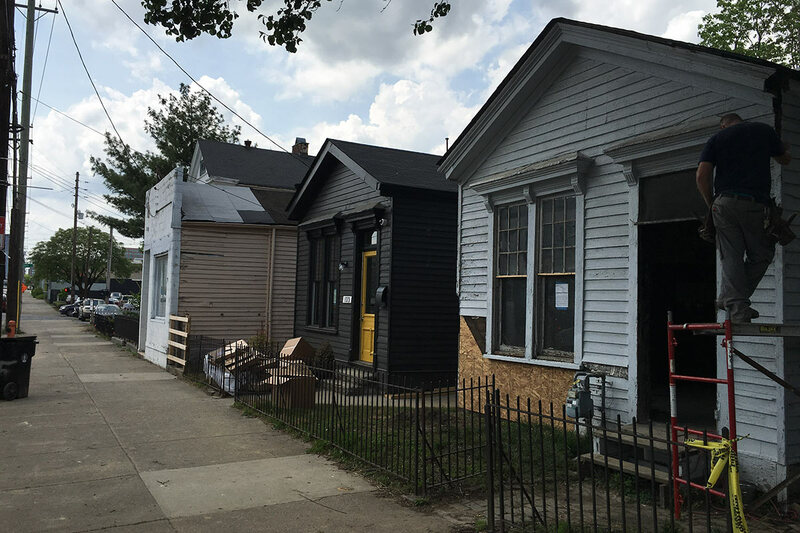 As we first reported back in March 2015, the project to renovate several individual structures on the block was initiated by Bruce McCann, of Coral Properties, who began renovating a duplex shotgun house at 115–117 North Wenzel Street. Whoever thought it up, the simple idea to renovate a half dozen houses into retail space along Main Street is shaping up to be one of the best examples adaptive reuse that celebrates Louisville built heritage since the Wayside properties were redeveloped to create a heart for Nulu. It’s inspiring to see one of the city’s oldest extant sections of urban fabric fortified with cutting edge concepts of preservation economic development. None of the buildings Blieden is working with on the Butcher Block development is historic, yet together they all form a cohesive urban streetscape that’s quickly shaping a real place. In urbanism terms, a block like this represents “incremental urbanism” where each building, in this case a row of houses, grew slowly over time, touched by the hands of multiple people, to become what it is today. In some cases this can be dramatic, like the change along Downtown’s West Main Street over the past two hundred years. Or in this case, more subtle, with the slow accumulation of storefronts, minor changes, or a new building slotted in here or there. This change happened slowly, fits Louisville’s distinct weird flavor, and, most importantly, provides a canvas on which to redevelop the border between Nulu and Butchertown with growing local businesses. Individually, each building provides an easy target for renovation, requiring less material and capital than building new. Collectively, they form a streetscape that gives Butchertown identity and authenticity. Where a strip mall falls short with dull blandness, working with this kind of incremental growth keeps it interesting. This is preservation at its best. Blieden paid $675,000 for McCann’s eight-building assemblage and added one more house to make the Butcher Block a nine-building project. 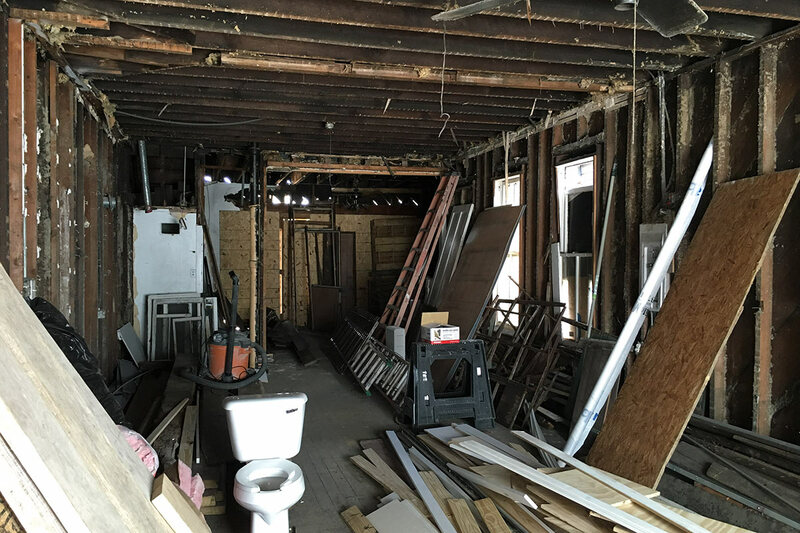 In August 2015, Blieden was awarded a $528,200 loan from the city’s METCO program to help “renovate and improve” the East Main Street properties. Blieden told Broken Sidewalk he’s investing well over what he paid for the properties in the renovations, but declined to give a specific project budget. 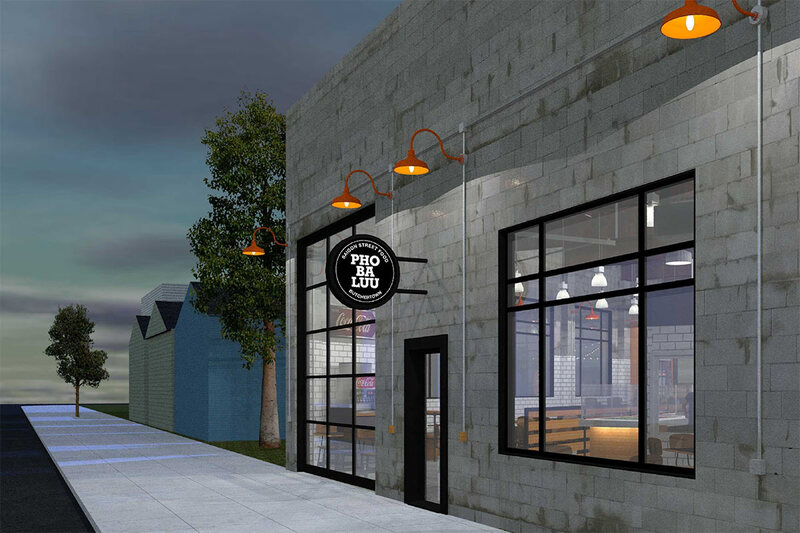 St. Matthews–based architect Ted Payne, who previously designed the nearby Copper & Kings distillery and the Play nightclub, is designing the project. “This is exciting,” Blieden said, grinning ear to ear. “How often do you get the chance to take a whole block that’s a mile away from the Central Business District and save it. It’s awesome.” Blieden previously developed the Butchertown Market, renovated a building that once housed The Blind Pig and is now home to Butchertown Grocery, and more recently built the Mellow Mushroom structure on Bardstown Road. “I’m very bullish on Butchertown,” he said. So far, Blieden’s got a stellar tenant lined up that includes a Vietnamese restaurant, modern home furnishings store, gourmet food shop, an artisanal doughnut proprietor, and maybe even a coffee shop. The largest structure at the east end of the strip is today a fast-paced construction site, with saws and hammers resounding through the former mechanic shop. The unassuming concrete block structure, now 75 years old, had been in need of some serious repair. And that’s exactly what it’s getting. Misaligned concrete blocks on the front facade have been leveled up, but that’s about the extent of changes you’ll notice from the sidewalk. “The exterior is not going to be painted,” Blieden said. “Ninety-nine out of 100 tenants would say you have to paint this. It’s been [collecting] patina since 1941.” Hanging from the facade, a neon sign with Vietnamese influences will announce the restaurant entrance. A new garage door, front door, and window will complete the look. Inside, the space features some original details from the garage contrasted with a new wood-plank ceiling, subway tiles, and an efficient layout that celebrates Vietnamese street food. For more on what’s in store at Pho Ba Luu, check out our exclusive interview with restaurateur Stewart Davis who walked us through the entire renovation. If all goes according to plan, Blieden said the restaurant could be open by the beginning of August. With the sound of hand sawing in the distance, Blieden walked me through the structure, already stripped of its plaster and lathe but still showing off most of its original details and molding. John Grieshaber, who is handling all the construction at the Butcher Block, said many of those original details will be saved. “We’re going to try to bring it back, as much to its original state as we can,” he said. Walking upstairs in the camelback house where the store’s office will be located, a small chamfered wall is noticeable at the back corner, a quirk of odd lot lines on the block. “A lot of times, I’ll come in here and think, what? I have lost my mind,” Blieden said. “It’s like building a ship in a bottle.” But it’s clear he wouldn’t have it any other way. 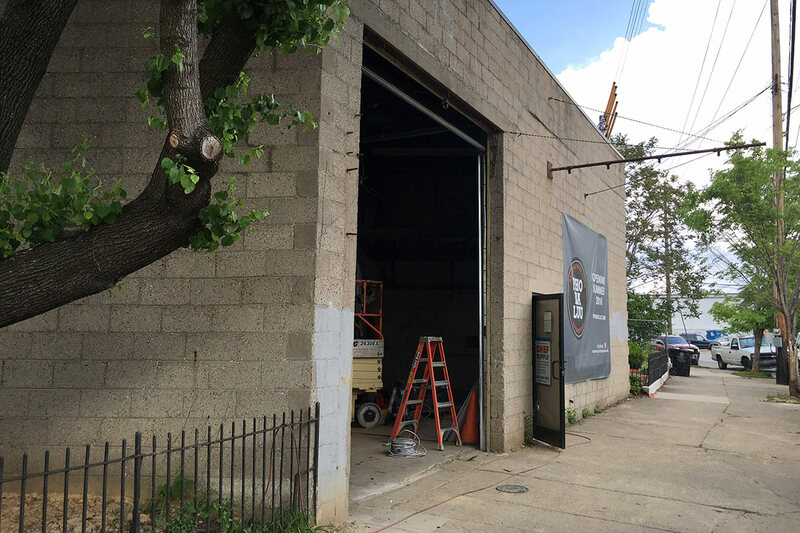 Blieden hopes Food Craft could be open by July. The new location allowed the studio to expand into a retail operation. 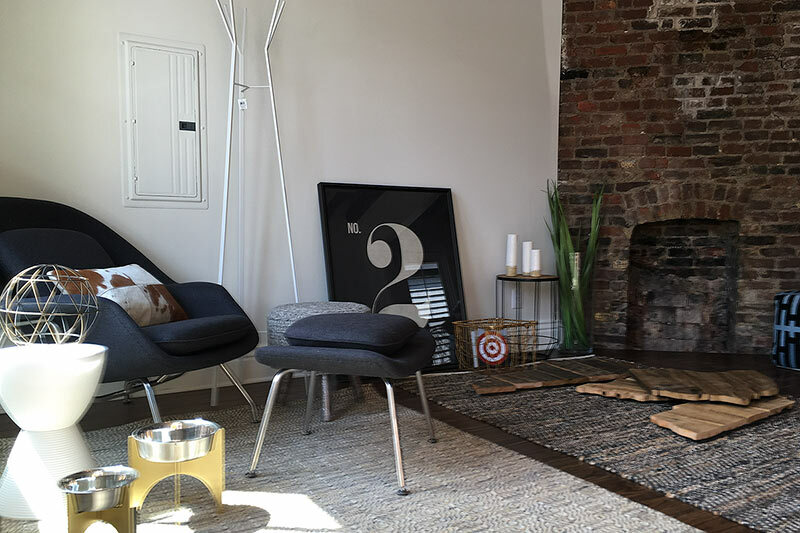 “The retail portion really comes out of some of our residential clients who are looking for modern home furnishings that are affordable,” Julie Meehan, president of Studio 360, told Broken Sidewalk. “We feel like Louisville doesn’t really have that. We felt like there was a hole in the market.” Stag & Doe will carry a variety of products such as art, rugs, sofas, end tables, lamps, and some gifts like wine openers and cheese plates, she said. Meehan said she and her three designers hope to hold a grand opening for their new space this June. And Blieden’s not joking. Hi-Five is known for doughnuts topped with cereal, oreos, large marshmallows, and bacon, among other things. Just check out their Instagram feed. Don’t line up for doughnuts just yet, Blieden said the store is expected to open by December. 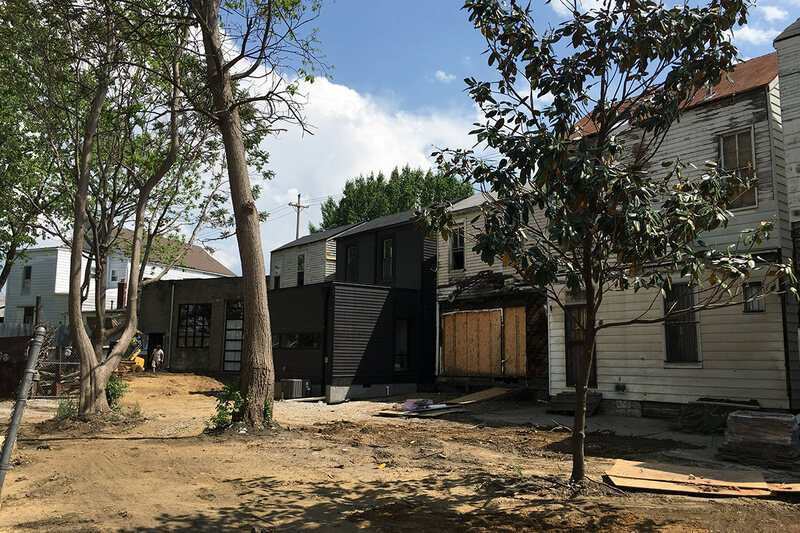 Moving along, the next shotgun house will be a live–work space for photographer Andrew McCawley’s First Light Image. 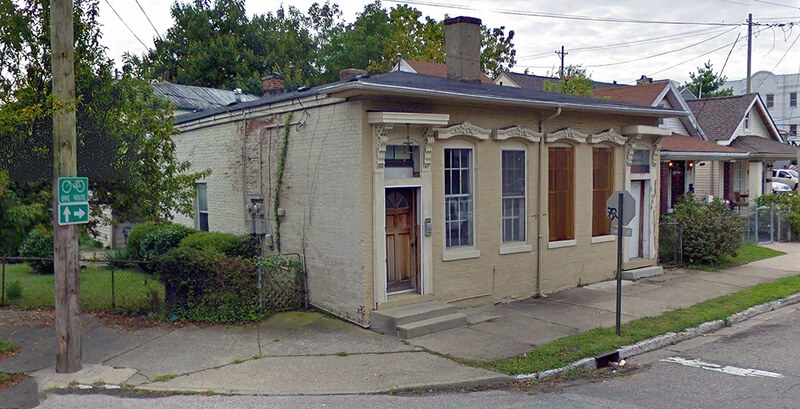 The camelback shotgun house has yet to undergo renovation, but will add to the line-up at the Butcher Block. “What great tenants, right?” Blieden said. “I have just the most awesome tenants.” He’s clearly excited about how the project is shaping up. The largest of the houses, the structure also needs some of the most work. Signs around the back warn to watch for holes in the floor, and walking around the side, layer upon layer of siding is peeling off, giving the effect of a sort of architectural mummy. Out front, the building also has some strange additions accumulated over time, including a quirky awning between the first and second floor attached to a red concrete block appendage. “I told my guys we’re keeping it because they hate it,” Blieden quipped. A design for the space is still forthcoming. “The idea is to bring it back to the original structure as much as possible,” Blieden said. Just behind the row of structures on East Main Street is the Butcher Block’s hidden surprise—an enormous shared landscape. “This is what’s really important,” Blieden said. “We want this to be a really nice shared courtyard.” The design for the courtyard space is still evolving, but Blieden said it could involve some kind of boardwalk structure connecting all of the businesses. Pointing to a pile of stones, Blieden said his crews uncovered the hidden foundation of a structure in the backyard space while doing grading work. “This is hand cut stone,” he said, “so we’re going to use that.” With a canopy from mature trees, once the space is landscaped, it’s sure to be a stunner. 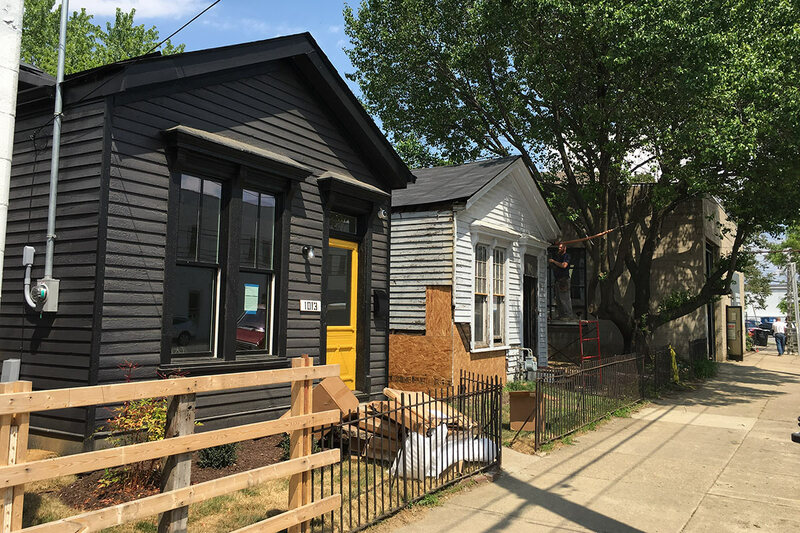 To the north along Washington and Wenzel streets, two more shotgun houses are being converted back to their original housing use. One is already done, complete with solar panels on its roof. Blieden said other buildings would also include similar panels. 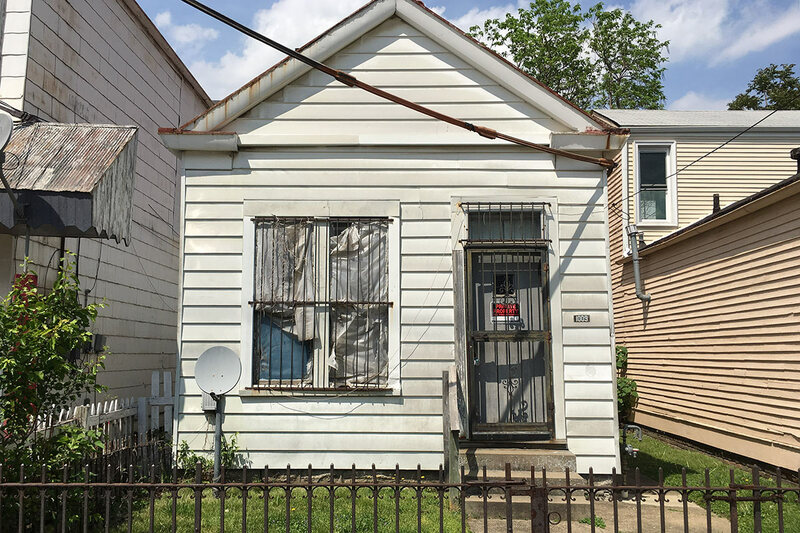 Finally, a duplex shotgun (pictured), one of the oldest in the area, today shows off a sagging roof and boarded up windows. Blieden said that building will eventually become office space and the site is currently going through the rezoning process. [Correction: An earlier version of this article stated that Blieden received a METCO loan from Metro Louisville and should not have labeled the loan as forgivable. The article has been updated. What a great project! Thanks for the detailed update. One thing I don’t see for any of the buildings being redeveloped is handicapped accessibility. Obviously the Vietnamese restaurant is accessible because it’s at sidewalk level but all the others have two or three steps into the front of the building. How is accessibility going to be handled for these businesses? It seems to be something that many projects don’t think about even though accessibility of part of the building codes and federal ADA requirements! Maybe they will be like many other places in town and treat those with disabilities as second-class citizens and expect them to come in through the kitchen, loading dock or whatever! There might be wheelchair access through the back of the buildings. Via the courtyard. Great story about how a developer works with tenants ahead of time to give them exactly what they envision! The ADA does not require private residences, or single apartment homes to be handicapped accessible. However, it would be prudent to offer them if possible. This size of project and the affordability of the improvements in this case may be a factor as well. I fully realize that the ADA doesn’t require accessibility for private residences and some other types of homes. However, the buildings shown in this article are not going to be residences, they are going to be businesses that are open to the public. Let’s according to the ADA requirements they must spend up to 30% of the total cost of the project to make them accessible! 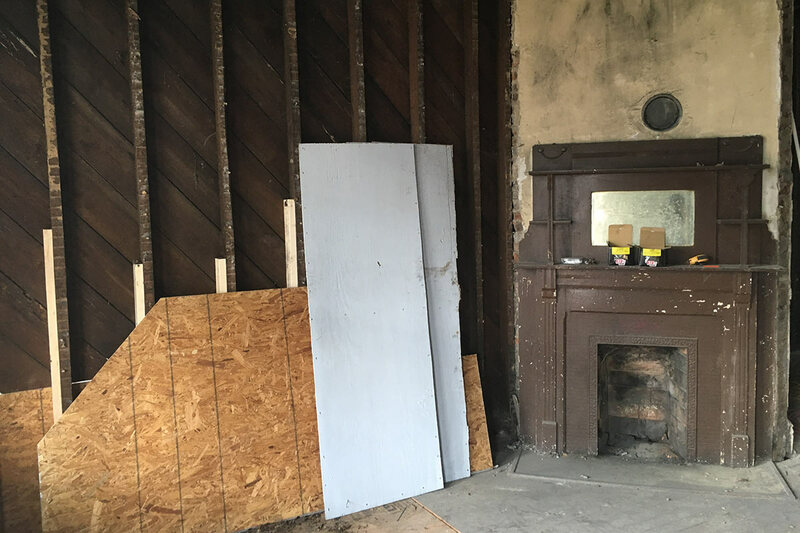 So in renovating historic buildings you expect them to blow out the original entries so they’re at least 3 feet and also wipe out the front so you can have 1:12 slope ramps, and what about the historic sized bathrooms? Just demo them and put in something larger?